In an eye-opening talk during the opening day of SXSW 2015, leading wearable technology and fashion expert Jennifer Darmour took us beyond the hype of wearables and into the next stage of the game. The bottom line: Sure, the technology is there, and, yes, it’s exciting. But the next wave is about brands bringing in meaning and emotion. Right now, we’re at the stage where we are trying to add fashion to wearables with textures and colors. But there really isn’t a true meaning or purpose, and it’s not aligning to bigger brand propositions. The goal isn’t to bedazzle wearables – it’s to give them the meaning to enhance our lives. We need to think about creating new experiences, and less about the technology. For example, the Fitbit and Tory Burch partnership is a great step – pretty and useful – however, it provides independent experiences for the user, who needs to purchase and connect two separate things. An opportunity lies in merging these separate experiences. Wearables have clear capabilities to improve our lives: think health, addiction and disease, for starters. The clear opportunity moving forward is brand alignment – how can we actually make this mean something? By making it meaningful, personal (after all, that’s the key value-add for wearables) and considering our audience’s core values, brands can take the idea of wearables and truly change the lives of their customers. Chrono Therapeutics has developed a new platform for helping people quit smoking. Up until now, there’s been very little innovation in the quitting-smoking industry. The Patch has basically gone from ugly to clear. Chrono, therefore, developed SmartStop (pictured below), which turned quitting smoking into something of pride. 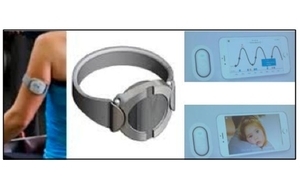 SmartStop offers proactive, automated and tailored medication delivery – and that clearly represents the utility, meaning and emotion of wearables. It makes quitting personal. It anticipates when cravings will occur and provides a higher dose of nicotine when cravings are strongest. SmartStop includes proactive digital coaching to equip smokers with personally relevant skills and strategies to help them quit. It also hones in on the habit and attachment component of the act of smoking, by changing the gestures one makes to change their intake of nicotine. The key takeaway: wearable technology cannot stand alone. Brands need to start leveraging what we know about our audience and what they care about to bring utility, emotion and meaning to the industry. And only then will it really take off.